the performance,the quality and the fun that the D-Zero can really deliver ! Ask for a demo near you, speak to the sailors, and see what the D-Zero is all about ! 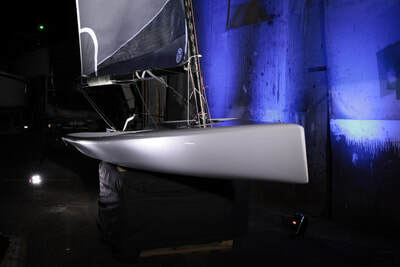 Compotech Carbon fibre spars, Harken throughout. Sailor weight range 60-110kg* - heavier sailors may have sailed the D-Zero, though we have never weighed anyone to confirm ! The very same high quality no compromise spec with a 6.9 m2 North Sails Kevlar laminated sail in Blue for the lighter sailor or youth, Compotech Carbon fibre spars, Harken throughout. * Sailors heavier and lighter have sailed the D-Zero with both rigs though we have never weighed anyone, just on their say, so we have tried to provide an indicative weight range for both rigs and is very much condition dependant ​- all the more reason to try the boat in similar waters to where you usually sail ! Prior to collection, we will fully check over the boat and ensure its ready to sail. Call or email us for the wide list of options available. - the other half wont like me buying one ! No problem, buy two ! Hi Dan, for our D-Zero sailors, what did you start sailing in ? Who made you go sailing ? etc My Dad always loved sailing, probably first sailing was with my Dad and sister in a friends little bilge keeler around Plymouth sound and up the river Tamar where I grew up. I got a £250 mirror at 11 with my Twin sis. We each got a suprise present of a laser as a 13th birthday present from my late uncle Nigel in Australia. He won the 1993 Sydney Hobart on Handicap so was quite a yachter. 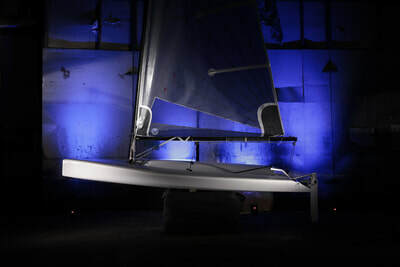 That Laser really kickstarted my sailing and I got pretty obsessed with it. I owned 10 lasers over the next decade, sailed all over the country and internationally and got right up to the top of the national fleet at a fairly golden period in the sport and even won a finals race at the worlds in maybe 2002. 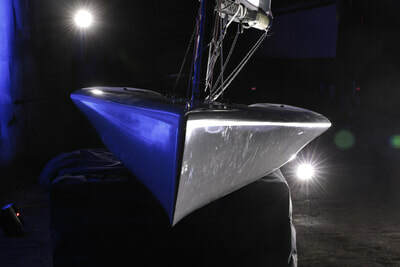 I also did a Naval Architecture degree, and spent a lot of the second half of my laser tenure imagining ways that the basic premise of boats like laser and even sunfish could be improved and brought up to date and be more sailor focussed without comprimising the leisure utility. We’re a really formal company Dan as you know, so some serious questions - Marmite, yes or no ? I am unusually indifferent to Marmite - I don't go out of my way to have it but if there is some in the house I may dabble. Why did you design the D-Zero ? I took 3 years in my twenties designing and building the punk dinghy, the predecessor of the D-Zero. Whilst I love it and still sail it, it was a custom boat and was more progressive that you could get away with in a production boat. Think of it as a "concept boat" as I wouldn't have turned many heads or covered much ground making something perfunctory. I always had a good idea of how I would "temper" that boat to make a productionised proposition, and I got the chance in the end! Best place you’ve sailed in the world ? Hmmm. I've sailed some bad places! Its got to be a good balance of friendly club ashore and decent sailing area. I like the variety - open sea venues with rolling waves, shifty east coast with brown water, estuaries with tides and eddies. Plymouth sound is pretty good. I like Palma and Hyeres on the right days. I think domestically you can't beat somewhere like Beer, Devon. What was the inspiration behind the D-Zero ? Same as the Punk boat, but grown up / toned down a bit. A mature proposition. To be the singlehanded beach boat for the 21st century. So make something simple and easy to rig and sail, versatile. Designed to be the perfect tool for the noble art of singlehanded unstayed dinghy sailing, but be equally at home taking out partners / kids off the beach. Favourite food you’ve ever had whilst sailing or at a sailing event ? I'm not really a restaurant regatta kind of guy. I've certainly had a few much needed dinners after some marathon Laser sailing sessions. That said, I did a POW week in maybe 2012 in a place in Scotland called North Berwick. Not a whole lot of boats but you could get lobster and chips takeaway from a van at the harbour, which was nice. How did Rodney & Sue @ Suntouched, then Luca & Roman @ Devoti become involved ? I met Rodney at an open meeting and the Punk boat had caught his eye. I think there was a perception amongst many that it was extreme but I think Rodney saw through that. Rodney very kindly introduced the idea to the guys at Devoti. I ended up loaning them my boat. Eventually it got out to the Devoti Academy in Valencia where a load of the lads had a go and enjoyed it. I was then invited out there and got to meet Roman and Luca, who made me an offer I couldn't refuse. Why choose Compotech, North Sails and Harken as equipment providers for the D-Zero ? Compotech were new to me despite the fact I actually know one of the directors - D-One sailor Humphrey Carter. But they had successfully been building the D-One mast and did a great job. They are great at engineering and are very diversified - in military / robotics too. The masts that they made were quickly good. I've always had a soft spot for Norths, they made the sails that I still have on the Punk boat and of course are the most successful loft in Olympic classes in the unstayed boats, so understood the "problem." I have also known Hobo Charlie and Ruairidh for a while so we could quickly get to the right product at the right price point. Harken are also a brand that I have always liked and they have always been very supportive of my silly projects, i.e. have excellent customer service. As a young lad I used to read the catalogues compulsively and I wanted a 57mm hexaratchet very badly when I was 11 or 12. Finally getting one on a boat was a major milestone for me. In all seriousness, the gear is robust and well designed and made, great quality, and has moved with the times very well. Best sailing movie if you can name one, and I guess its not Titanic ? Waterworld. Costner at his best. Ha! In seriousness I've always loved 60ft tris since I was a nipper looking at them close up in the marina in Plymouth. There is a good scene in the Thomas Crown Affair. Apart from that I like seeing how boats float and move through the water. So I go more on Youtube, but find the trendy modern quick scenes a bit frustrating. What can you say to potential buyers of the D-Zero ? And why ? I'd say to potential buyers and anyone else to have a go in one. It does very well in back to back comparisons! There are a lot of passionate guys and girls in the class who are very supportive, but I think I would like my boat to be thought of as a freesailing beach boat as well. Bare feet or wetsuit boots ? I love barefoot but generally ends up in cuts and grazes from toestraps or stones or what have you. So I D-Zero or windsuft barefoot if I can. Think the grip is too dodgy for trap boat sailing though so go with boots there. Where do you see the future of the D-Zero ? I'd like to see continued growth, getting into more countries, bigger racing fleets. Perhaps more penetration into the recreational market / freesailing which I reckon is the boat's secret strength. Ever sailed to music ? And if so what ? Or do you sing to yourself ? Never sailed to music but especially singlehanded sailing I get "earworms." I never have any control over the earworm, but the more I like it the better I sail. Whats next Dan ? What are you sailing now ? I'm trying to sail the i14 I designed and built. Trap boat HP sailing is a long way from my comfort zone still and I seem to struggle to get any time in the boat. But its like the punk boat all over again, enormous pride of ownership and the good bit about being rubbish is that the gains are quite easy to come by, so that is rewarding. I'm hoping to get half decent in that and do most of the i14 regattas this year. And last serious question, you know the form now, so best excuse for not going sailing ? Ha I rarely miss sailing if its on offer apart from illness. Does going windsurfing instead count? Even hangovers, back when I was a younger man never stopped me much. Thanks Dan, think its time to go sailing ! Cheers. Cheers! More stories to follow from Rodney & Sue Cobb at Suntouched Sailboats, and also Roman Teply from Devoti, as to how they got involved and how they have made the D-Zero that we know today !